In the summer of 1840 two of London’s most prolific writers and journalists, Mr and Mrs S C Hall, set out from London for an ambitious tour of Ireland. 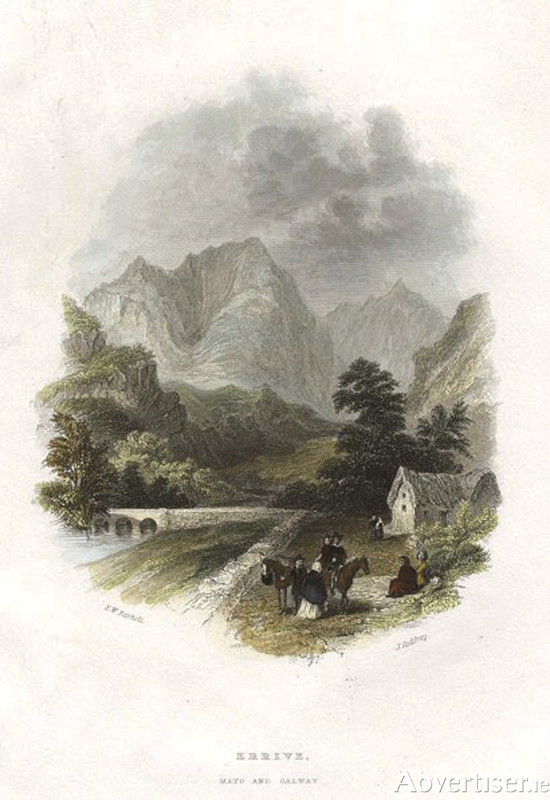 They would later publish their journey and observations in Ireland - its Scenery and Character, a best selling three volume snap-shot of Ireland, sumptuously illustrated by engravings created by the best artists of its time*. It is a treasured collector’s item today. Both Anna Maria (Fielding ), and Samuel Carter Hall were originally born in Ireland, but emerged as lions in the rising tide of the great Victorian appetite for literature, travel and magazine reading. The Halls were a phenomenon. They produced some 400 books, plays, articles, children’s stories, musical comedies and religious tracts, between them. They returned to Ireland on this occasion because of the new Victorian passion for travelling, which was satisfied by the growth of railways and hotels. Their books would show the traveller the best places to visit for fishing, hunting, and spectacular scenery, as well as robust observations on the people and places they met and travelled through. Because the Achill Protestant Mission had recently opened an hotel, the Halls made their way there. No doubt they had heard of the spectacular beauty of the island’s landscape, and must have been curious about the controversial stories emerging about the Mission, which was generously supported by contributions from England. From outward appearances the Halls had much in common with the founder of the Mission, Rev Edward Nangle. Like him they agreed with evangelical missions of this sort, believing that Protestantism contributed to the improved well-being and prosperity of Ireland. They were soon to be disillusioned. As they approached Achill island, off the north Mayo coast, they met a wretched looking boy of about 13 years of age, clothed in rags who told them that he had been expelled from the colony’s orphanage. He told the Halls that Mr Nangle had taken away his decent clothes, and given him three shillings to convey him to county Sligo, about 60 miles away, where his grandfather lived. Puzzled at the treatment of the boy, the Halls brought him back, and confronted Nangle. But Nangle was adamant he would not allow the boy into the Mission. The boy had probably been cheeky and undisciplined and did not fit into Nangle’s ordered world. The Halls gave to boy extra funds to support him on his way, and took him some of the distance in their carriage. Later, when driving through Newport, they discovered that five other boys had also been dismissed in similar fashion from the orphanage: ’six poor little helpless and deserted children were cast upon the world, nearly naked and penniless, without parents, without homes, and without friends.’ Sufficiently alarmed at the treatment of the boys the Halls demanded to see the account books, and began to question the methods employed in the running of the Mission. The Halls quickly concluded that the Protestant Mission on Achill, generously supported by donations from England, was not good value for money. By 1842, nine years after the colony was established, it accommodated 56 families (365 individuals ). Out of the island’s 6,000 Catholic population only 92 had converted to Protestantism. Despite generous donations there was no improvement in the general well-being of the Achill people. The accounts were a ‘very confused document’. The Halls noted that the mission’s bounty was only given to those who professed to convert to the Protestant faith. Their verdict concluded that the mission was a ‘complete failure’, and that Rev Nangle did not conduct his establishment with any sense of ‘gentle, peace-loving Christian zeal’. Those who subscribed to the mission’s work were ‘spending their money on a worse than useless cause’. The censure was public, hard-hitting and damaging. Of course it infuriated the Rev Nangle. He went on the offensive in his newspaper the Achill Herald denying that the hospitality of the mission was only given to those who converted (a denial that would later come to haunt him ). He defended that spending of the money because he bought the best available building materials. He invited the expelled boys back to the orphanage, where ‘they are doing well’; and went on an intensive fundraising drive in England, which damaged his health. But now the Great Famine was almost upon them, and it gave the Mission an opportunity to help the community in a practical and Christian way. Following the Great Famine, however, the Halls did offer a more benign assessment of the Achill Mission. NOTES: Ironically the Halls noted a significant improvement in the standard of life in Ireland since a previous visit in the 1830s. But all that was about to change rapidly by the arrival of the Great Famine 1845. Visually the Halls made an odd couple. Samuel is thought to have been the model for Pecksniff in Dickens’ Martin Chuzzlewit, an unctuous English architect whose insincere behaviour made the name synonymous with hypocrisy. Anna Maria, however, was widely esteemed for her kindness and generosity. I am leaning on Patricia Byrne’s The Preacher and the Prelate, published by Merrion Press, €14.99.